How Charming! Keep your most important information right at hand with our Beth Charm Bangle Medical ID. This stainless steel, water-friendly bangle bracelet is plated in a rose gold tone finish and includes a matching medical ID charm featuring the internationally recognized medical caduceus symbol on the front, which alerts medical personnel to your information, engraved on the back. 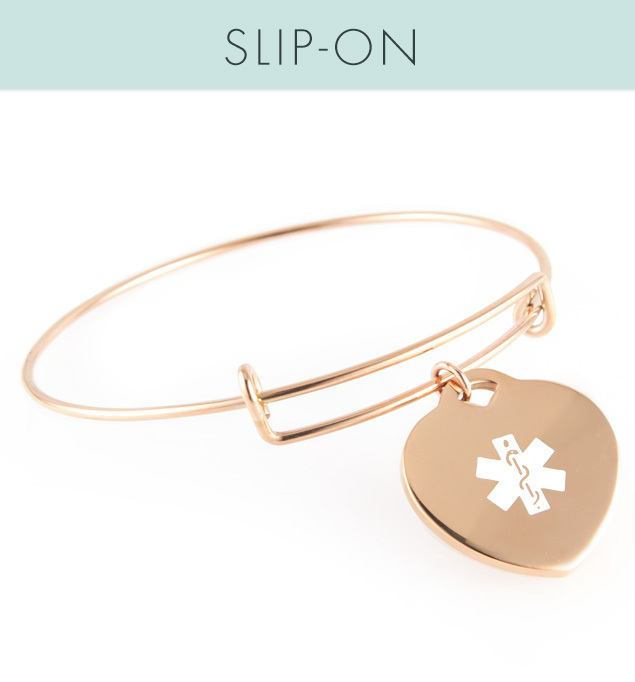 Part of our Slip-On Collection, the Charm Bangle Medical ID Bracelets are designed to be easy to put on and take off over your hand without traditional clasps. Simply pull wider to put on and squeeze gently to wear comfortably. Whether you or your loved ones wear a medical alert bracelet for gastric bypass or sleeve surgery, lymphedema or post-mastectomy care, heart conditions, steroid dependency, or any other medical condition or treatment consideration, Slip-On Medical ID Bracelets are a terrific option. Water-safe and on-trend, these durable medical ID bracelets are easy to adjust and put on, making them ideal for people experiencing swelling of the extremities, weight fluctuations, or dexterity challenges. One size fits most wrists sized 5.5”-8”.